Good suggestion. There are other options too. We recently noticed that our router wasn't cutting squares. It looked like the bed got a bit of a warp in it when it was moved to our new facility. Part of the fix was to add a second home switch to Y (Y was driven by two steppers, two drives, but one set of step and direction signals) and then drive the two motors independently. Our machine startup routine then homes both sides of the gantry, initially together, then independently. Assuming your controller supports this, it's a fairly bulletproof way to make sure everything stays square. The pic shows one of the homing proxes and the other thing we did which was replace the feet with 25mm all-thread sunk into the slab so we could pull the warp out of the bed.. Sorry for the long blather! Its a topic dear to my heart, and one that I spent a LOT of time on to get my printer working right. Don't be daft. I really appreciate the write-up. I'm still a little surprised by how complicated 3d printers are. Or at least how the better ones are. 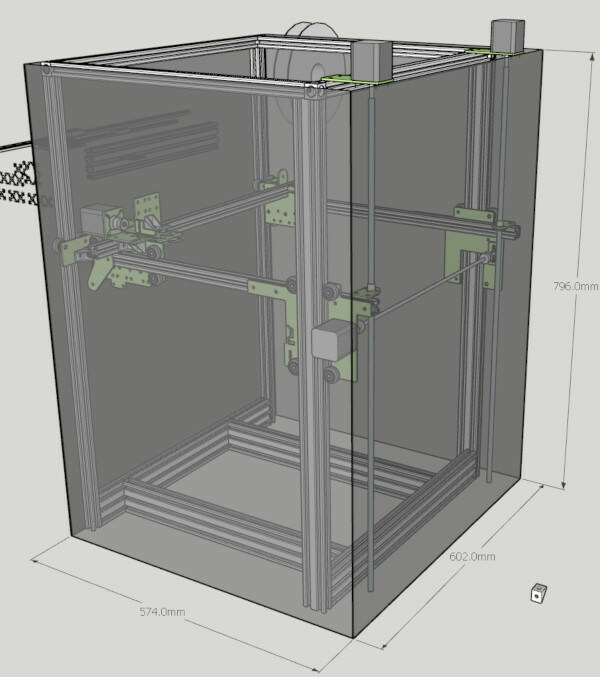 Been a little busy with some other stuff lately but i'm slowly 'assembling' your machine in CAD (sketchup!) so I can try get a better idea of how it works. And also look at making it a little narrower but a bunch taller. I figure I could replace the verticals, or at least the ones on the Z leadscrew side, with 20x40 extrusions to make them less prone to flexing if they're longer. In the meantime I keep thinking up loads of stupid project ideas to make use of a 3d printer I don't have. Still want to do that colour mixing stuff but that's getting buried under stuff I think might be easier and more saleable. 20x40 will definitely pay off on the main Z verticals and the two y rails. Everywhere else it won't help much, just get in the way. Going to less length on the y rails will help drop too. I can easily make you dxf files for the plates corrected for those rail dimensions, if you want them. I've downloaded the dxf files from your thingiverse page and gonna try import them into sketchup at some point. I figure i'll start with the thing as close to yours as possible and then start shifting the dimensions about from there. I also feel other people might make some use from a CAD drawing, even if it's sketchup. This took a while. Sketchup is a pretty awful program and it's dwg impoter likes to add 100 sides to every circle, so I had to go through reducing the count on every arc and hole. Other cad programs actually treat circles as circles and just add more polygons as you zoom in but not sketchup! It annoys me that they're just sitting on a pile of patents for stuff that'd be nice in real cad programs, but sketchup is pretty much unchanged from when google bought it. There's alot of details to add but for my own purposes I think adding every pulley and screw would be crazy. Gonna take a break then shift it around. Then actually price it out and get a fright. I've already had a look at those V-slot wheels and boy do they charge alot. There's a time i'd have machined them myself to prove a point but i'm starting to find myself short on time now. Still hoping it'll be around £300 at most though but that seems unlikely. It's easy to forget the cost of all the little things like brackets and fasteners. Do the different types of wheel/rail interactions make more sense now? You can imagine what happens if the two back Z rails move toward or away from the front ones; a few mm either way doesn't affect the operation at all! I essentially treated my Cobblebot kit as a box of parts to build from, some of which kind of sucked. The Arduino was a junky clone and the wheels were terrible. Yeah, that stuff adds up quickly! Oh, I should mention: I have a new design for the Z plates that has a much longer arm along the Y rails to reduce the sag. If you re-style it to 20x40 the deflection will drop by 57% anyway. Probably still worth having the new plate design. I agree, Sketchup has some really cool stuff and some really terrible stuff. Its all about the visual! Tricky to get it to produce good STL files, but that's what I work in... I actually worked with some folks who designed a complete cement plant in Sketchup! OMG a big model! Can I get that SKP model to add to the Thingiverse file? PM me your details again and i will search out that box O bits i have. If you moved the leadscrews to the middle of the Z gantry on either side, wouldn't you have a much better chance of the wheels running without binding? Is there a reason for having the Z axis moving the hot end up rather than the build plate down? Wouldn't having the hot end moving in all three axis make it more vulnerable to vibration errors? I would think that a cast aluminium tooling plate bed dropping down with gravity and held in place by a couple of big beefy NEMA 17 motors with astrosyn damper clones and trinamic stepper drivers would make for a Z axis with minimal vibration issues. With a strong non moving top frame to float the XY gantry on, you can focus on making the gantry as light and vibration resistant as possible. 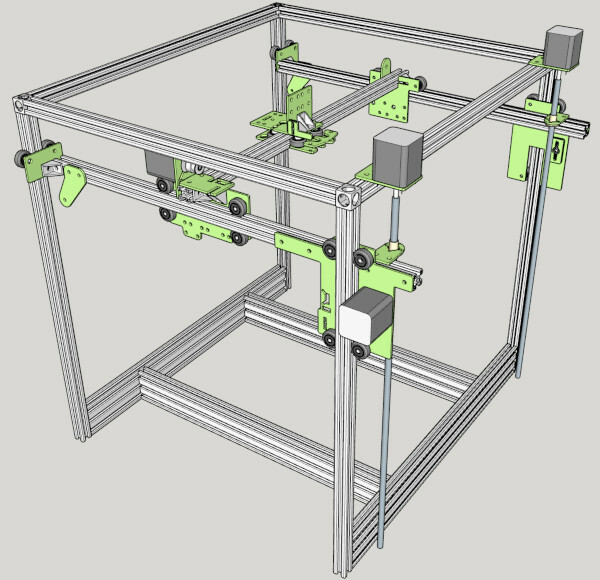 There was an interesting thread on the reprap forum a few years back on someone designing a z axis with 3 leadscrews and no slides driven by one stepper motor and pulley/ belt arrangement. I've worked with moving part printers, and Z is certainly the right axis to choose! I agree that three axis motion on the extruder leaves you more open to vibration that 2 axis. I was happy with that tradeoff, though. With my design, the optimum location for the Z force is on the front two columns, as those are the ones that control rotation around the X axis. If you put the Z drives in the center of the Y rails you have the additional problem of reversed loading; it wants to move like a see-saw, and your backlash adjustment is really critical. With my layout the loading direction on the bearings is always the same. I mentioned it earlier but my thought is that you'd want to keep the forces in a constant direction so you're only dealing with flexing. Where if it was in the middle then any time the gantry crossed over the pivot of the screw, any play in the bearings/ rollers would let it abruptly tip over. I think i've seen that leadscrew only Z axis thread. It is pretty cool but I think it'd be dependant on fairly decent ballscrews. Yeah they make more sense now, assuming I made the model right! From photos I was thinking there was a weird combination of rollers on flats and in grooves but it's alot simpler than it seemed. https://drive.google.com/open?id=1dQQLoEQGdezWYBSKnv0mcwOitJjoQ6Yb Hopefully this link works. Tell me if I got it totally wrong. Some day I might actually start building something other than a CAD model. Price of the extusions comes to about £85, assuming they don't charge per cut. And not including delivery. If I was smart I could try mix and match the considerably cheaper regular extrusions against the V slot type depending on if they actually need the groove or not. 23 wheels are £91.91 at the UK based reseller, and £88.79 at the US site with shipping. It's alot of money for plastic wheels. I looked at these wheels right when I started thinking about 3d printers and if I remember right I priced it out machining my own and found it wasn't too much of a savings mostly from the cost of bearings, and the few cheap ones I bought to take a look at were all seized solid from tight fitting seals. But with steel being pretty damned cheap, and the other hardware hopefully not amounting to too much, i'd like to think I could build the frame and moving parts for about £300. So I can get that done before worrying about electronics and the enclosure. I've really thought about it. Just drilling right through and parting off, and hoping some retaining compound and a washer will be enough to stop the bearings walking out of the wheel, since that'd be alot simpler than a ledge in the middle. Then shoving that on a mandrel to cut the outside and chamfers. The 625 bearings themselves though would cost £52 from simplybearings, and as I said the cheaper ones I tried from ebay were all seized solid from the seals. Making my own at that point would probably still be cheaper, but not a huge savings and not a job I particularly want to do. I'll keep thinking about it and see if I can find that handful of bearings I bought. I bumped into them not too long ago but I forget where. You can use shielded bearings if you want lower friction. Just placed the order for all the extrusions and corner brackets. I'm maybe jumping the gun a bit, but I figure if I sit on this thing any longer i'll never get it started - let alone finished. Through the week i'll have a look around to get some quotes on plasma cutting for the plates, and also assemble a list of all the fasteners i'm gonna need. Are you in the US or UK? There's some screws you only need 2 of, and I bought box quantities... happy to share! PM me your ship-to if you'd like some. I might have a spare double pulley, gotta check... I highly recommend the double belt with the shaft across the front. I machined the idlers for the Z belt loop. I need to see if that made it into the docs. (Long pause) yes, it's in there. Did you find the google doc instructions? If you PM me your email address, I (think) I can give access to the common doc. I'm in the UK i'm afraid, but thanks for the offer. I am planning to machine all the parts I can handle on the lathe though, as well as czech out how deep a chamfer I can cut with delrin. For Z belt idlers i've got a whole bag of 8mm hole toothed pulleys. I did find the build instructions. They were a big help for figuring out what half the plates are for. Although i've spotted a couple errors I made since posting the sketchup model, such as using the same motor bracket as the X axis for the Z steppers, which was reducing the volume a bit. I am planning to machine all the parts I can handle on the lathe though, as well as czech out how deep a chamfer I can cut with delrin. .. I did some batches of rope pulleys out of POM (Delrin). Check this thread, hope is inspirational. It's reassuring to see that huge form tool cut without any chatter. I've heard acetal machines well but never had a reason to try it. That's a beautiful mandrel too. I was affraid that the form tool would dig itself into work, therefore "front relief" was pretty small, you almost need to push it into POM (Think I needed to adjust it just tad "under" centre line) and it does not crab. It is pretty sharp on the front (big "Back rake") to sheave off nice swarf. Thermo plastics are next to dog sh*t compared to tool steels when it comes to cutting forces. This would not work with most of the metals on these dimenssions (metals you get chatter or resort to skiving tool). Nice the extrusions arrived, and all seem to be the right length. I gotta say these corner cubes look terrible though. They threw some sweets in the box too but at over £100 it'd take more than a few refreshers to impress me. My pledge to the world is that if I ever run a tool related online shop i'll throw in a few pozidriv tips with big orders. You can never have enough of those. Edit: First things first though, I gotta try clear some space to put it. If you are machining wheels, the consistency of chamfers is critical to the function. I just realised that earlier today. That i'd only need to chamfer... 16, i think, out of the 20-something wheels. That means I could just buy the 16 ready made wheels. That's still £45 for just the wheels themselves and not the bearings. I'm thinking the absolutely critical dimensions are the concentricity of the outside chamfer to the inside, the chamfer being perpendicular to at least one of the sides... or the bore (flanged bearings are confusing), and then the chamfers being parallel to each other. The width and depth of the chamfers would be nice to keep accurate but I feel it's something that could maybe be adjusted to compensate for with shims and stuff. Yes, the chamfers need to be concentric, but the thing you really need to control is how far the chamfers fit into the linear rail. Thus, the width and angle of the chamfers is important. You could gauge it by pressing a scrap of rail against the wheel and measuring the wheel OD to the far side of the rail. My model shows 42.09mm for this dimension (probably 42.0 mm in reality). You can live with this being a bit bigger or smaller due to the eccentric adjustment, but you really want them all the same.